Based on the comic series by Stan Lee, Jack Kirby, and Larry Lieber, Thor: Ragnarok is the story of the godly figure who finds himself in danger when a mysterious figure has returned to Asgard to wreak havoc forcing Thor to seek help from an ally and other figures. Directed by Taika Waititi and screenplay by Eric Pearson Craig Kyle, and Christopher Yost, the film is an exploration of a man trying to fulfill his role but also rectify the mistakes of the past as Chris Hemsworth reprises the role of Thor. Also starring Cate Blanchett, Tom Hiddleston, Mark Ruffalo, Tessa Thompson, Idris Elba, Karl Urban, Jeff Goldblum, and Anthony Hopkins as Odin. Thor: Ragnarok is a sprawling yet witty film from Taika Waititi. Two years after the events in Sokovia where Thor helped the Avengers saved its people, the film follows the godly figure trying to get answers about the Infinity Stones where he learns that a mysterious figure named Hela (Cate Blanchett) is returning to Asgard to make her claim to its throne and its people. It’s a film that has Thor not only try to find out the whereabouts of his father but also deal with the sins that Odin had been carrying as it include Hela who is revealed to be Thor’s older sister that was cast out of Asgard due to her dark ambitions. With the help of his adopted brother Loki (Tom Hiddleston), Thor tries to stop Hela only for things to go wrong as she takes control of Asgard while Thor finds himself in the planet of Sakaar. The film’s screenplay doesn’t just explore the sins that Odin has laid upon for his sons who are forced to work together and deal with themselves but also realize the role that Thor is destined to carry as he is Asgard’s true heir. The script also has this unique structure that doesn’t just play into the development of the story but also the characters as Thor is first seen imprisoned by the fire demon Surtur (voice of Clancy Brown) in his search for the Infinity Stones where he also learns of the prophecy known as Ragnarok that will deal with the end of Asgard which had been in Thor’s mind for some time. Upon his return to Asgard where he learns that his father had been away, he turns to Dr. Stephen Strange (Benedict Cumberbatch) for help where he and Loki find Odin’s whereabouts who reveal his own sins and the return of Hela. The second act isn’t just about Hela taking over Asgard as well as deal with a resistance led by Heimdall (Idris Elba) who had taken the sword that controls the Bridge to all nine realms. It’s also about Thor in the planet of Sakaar where he’s captured by a woman named Valkyrie (Tessa Thompson) where he’s forced to become a gladiator for amusement of the planet’s leader in the Grandmaster (Jeff Goldblum) where its champion is none other than the Hulk/Bruce Banner (Mark Ruffalo). Thor has to convince the Hulk to join him in saving Asgard as well as Valkyrie who was once part of an army of warriors that tried to stop Hela years ago. Taika Waititi’s direction is very offbeat not just for the fact that it’s a film with grand visuals and set in a large universe but it’s also approached with a sense of humor mixed in with bits of tragedy. Though shot mainly on soundstages at Pinewood Studios in Atlanta, the film also shoots on location in New York City and parts of Australia with the latter as the forest and mountains in Asgard. Waititi does create something that is grounded but also maintain the importance of the different lands and galaxies where it is very diverse as well as filled with all sorts of ideas of the world that Thor is encountering. Waititi would use some wide shots for those locations but also in some of the battle scenes and in the gladiator showdown between Thor and Hulk as the latter is this mixture of humor and drama. He would also use some close-ups and medium shots as it play into the situations that Thor is in whether it’s being imprisoned at Sakaar where he would befriend other gladiators including a rock-like creature named Korg (Taika Waititi) or coping with the sins of his father. The direction doesn’t showcase the motivations of Hela in the need to claim her place in the throne as Asgard’s sole ruler but also infuse with some dark humor where Hela is someone that is just hell-bent on wreaking havoc. Waititi would also showcase Asgard when Odin isn’t available as it include this play of Thor and Loki’s adventures where Thor is watching with befuddlement. It’s among these offbeat moments in the film that add a lighter touch to the action and drama as well as the scenes in Sakaar where the Grandmaster is this oddball man that is ruling a planet yet he’s so weird. The film’s climax in which Thor, Loki, the Hulk, and Valkyrie battle Hela and her army as it does play into Thor’s own insecurities into not living up to his own claim for Asgard’s throne. All of which forces him to unveil his true powers and bring some redemption for his father to save the people of Asgard. Overall, Waititi crafts an exhilarating and evocative film about a god trying to save his people from his evil sister with the help of a few allies. Cinematographer Javier Aguirresarobe does brilliant work with the film’s cinematography from the colorful exteriors of the scenes in Sakaar and Asgard as well as some of the interiors for the scenes at Dr. Strange’s home and at the palace of Asgard. Editors Joel Negron and Zene Baker do excellent work with the editing as it is stylized with conventional fast-cutting in the action but also use some straightforward cuts for the non-action scenes to establish what is going on. Production designers Dan Hennah and Ra Vincent, with set decorator Beverley Dunn plus art directors Bill Booth, Brendan Heffernan, Richard Hobbs, Alex McCarroll, and Laura Ng, do amazing work with the look of the different worlds from Dr. Strange’s New York home, the places in Asgard, and the coliseum at Sakaar. Costume designer Mayes C. Rubeo does fantastic work with the costumes from the design of the gladiator gear to the clothes that Hela, Valkyrie, and the Grandmaster wear to play into their offbeat personalities. Hair designer Lucy Vannella and makeup designer Vincenzo Mastrantonio do terrific work with the look of Hela in her hairstyle as well as Thor’s haircut before the gladiator battle and the makeup some of the people at Sakaar wear. Special effects supervisors Brian Cox and R. Bruce Steinheimer, with visual effects supervisors Megan Flood, Jake Morrison, and Stuart White, do incredible work with the visual effects from the look of the Hulk and some of the creatures Thor encounters to the look of the planet that Sutur lives in. Sound designers David Farmer and Shannon Mills, with co-sound editor Daniel Laurie, do superb work with the sound in creating sound effects for some of the action as well as the way the Hulk sounds and some of the objects in the different planets such as the guns at Sakaar. The film’s music by Mark Motherbaugh is wonderful for its mixture of electronic synth-pop with elements of orchestral bombast as the latter play into some of the adventure and action while the electronic pieces play into the world of Sakaar while music supervisor Dave Jordan provide a soundtrack that is just as offbeat from the usage of Pure Imagination from Willy Wonka & the Chocolate Factory to Led Zeppelin’s Immigrant Song which makes perfect sense for the film’s action scenes as its lyrics features a lot of Norse mythology that relates to Thor. The casting by Sarah Finn and Kirsty McGregor is marvelous as it feature some notable small roles and appearances from Clancy Brown as the voice of the fire demon Sutur, the trio of the Warrior Three in Tadanobu Asano as Hogun, Ray Stevenson as Volstagg, and Zachary Levi as Fandral who are among the first to confront Hela at Asgard, Rachel House as the Grandmaster’s bodyguard Topaz, director Taika Waititi as the rock-like gladiator Korg who provides some funny commentary about Thor’s situation, the obligatory Stan Lee cameo as Thor’s barber, and Benedict Cumberbatch in a brief but terrific appearance as Doctor Stephen Strange who helps Thor find the whereabouts of Odin through his own powers. Karl Urban is superb as the Asgardian warrior Skurge who watches over the Biofrost as he becomes a reluctant aide to Hela where he copes with the choices he makes. Anthony Hopkins is fantastic as Odin as Thor and Hela’s father and king of Asgard who deals with his own exile as well as the regrets he made in his life where he ponders what will happen to Thor and Loki upon Hela’s return. Idris Elba is excellent as Heimdall as the former watcher of the Biofrost who has become a fugitive due to events from the last film as he leads a resistance against Hela where he does whatever he can to help the people of Asgard. Jeff Goldblum is brilliant as the Grandmaster as the odd leader of Sakaar who rules the planet with a mighty fist but also with some eccentric ideas as he cares more about having gladiator shows than cleaning up his dirty planet. Tom Hiddleston is amazing as Loki as Thor’s adopted brother who has been trying to create mischief at Asgard due to Odin’s absence as he deals with the presence of Hela while being very conflicted into helping Thor and Asgard or himself as he also struggles with his own shortcomings. Tessa Thompson is remarkable as Valkyrie as a former Asgardian warrior who had fought with Hela a long time ago as she is reeling from bad memories while unsure if she wants to help Thor in order to find her own redemption. Mark Ruffalo is incredible as the Hulk/Bruce Banner where he appears briefly as Banner as the man who had been lost in the role of the Hulk as he tries to comprehend what has happened to him whereas the Hulk has become a figure that feels loved and appreciated at Sakaar instead of being seen as a monster on Earth. Cate Blanchett is phenomenal as Hela as Odin’s first-born child who had been his executioner and right-hand woman until her ambitions overwhelm him as this woman that is just pissed off in being exiled as Blanchett provides a bit of camp but also has this air of charisma that makes her so interesting in being one of the best villains in the MCU. 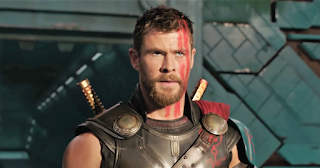 Finally, there’s Chris Hemsworth in a sensational performance as Thor as the Norse god who is trying to find answers about the Infinity Stones only to learn about the revelation that he has an evil older sister where he deals with his own shortcomings as Hemsworth displays some humility as well as some great comedic timing that adds to his sense of humility. Thor: Ragnarok is a spectacular film from Taika Waititi that features great performances from Chris Hemsworth, Cate Blanchett, Mark Ruffalo, Tessa Thompson, Jeff Goldblum, Tom Hiddleston, and Anthony Hopkins. Along with its supporting cast, dazzling visuals, killer music soundtrack, and themes on sins and duty. It’s a film that manages to be compelling in its themes while providing moments that are exciting as well as being very funny. In the end, Thor: Ragnarok is a tremendous film from Taika Waititi.